2019 Veterans Day discounts, free meals, deals, and sales. As Veterans Day approaches, we will continually update this list as restaurants and companies announce their Veteran’s Day specials. Typically offers are announced just before Veteran’s Day in late October and early November. For information on National Retail and Services Offered or Local Veterans Day Offers, visit our other two Veterans Day offers pages! BOGO, buy 1 get 1 free individual meal and drink with Coupon on 11/11 and 11/12. Break Time will give all veterans a free medium fountain drink OR 16oz coffee on Sunday and Monday (11/11 & 11/12). Veterans & Active Duty Military can enjoy a free “Choose Any Two” offering on 11/11 AND 11/12. Participating locations will offer veterans and active duty military a complimentary free entrée from a Veterans Day menu, on November 10th through 12th. All active duty and Veterans are invited to come in and enjoy Free Red, White, & Blue Pancakes on Monday, November 12, from 7 am to 7 pm. Available both Sunday and Monday (11/11-/11/12), veterans and active duty service members get a free burger or sandwich and non-alcoholic beverage. November 10th – 12th veterans receive free coffee at Kwik Fill coffee locations. From Sat., Nov. 10 through Mon., Nov. 12, military service men and women and veterans will receive their choice of a complimentary signature wrap, plate or gourmet salad when they purchase a meal. Free drip coffee or tea to members of our U.S. military and veterans. Valid on 11/11 and 11/12. Saturday through Monday all Veterans will enjoy a free entrée. November 10th through November 17th .25 cents will be donated back to the community for every Veterans day IPA sold. Free cup of coffee to our servicemen and women with a military ID starting 11/9 through Veterans Day Weekend (11/11). Military veterans and active duty military who show proof of service can visit a participating White Castle location on Nov 11th or 12th, and receive a free breakfast combo or castle combo meal #1-6. On 11.11 AND 11.12, Yogurtology will offer a free 5 ounce frozen yogurt to all veterans and active military personnel who visit one of their locations. Veterans can get a $25 gift card to be used toward a future visit on 11/11 or 11/12. Military ID required. Dine-in required. Veterans and active duty eat free on Sunday, 11/11/18. This year on Sunday, November 11, veterans and active military men and women receive a free Pulled Pork Sandwich, 1 Regular Side, & Drink. Veterans, Active Military & Gold Star Families, this Veterans Day, Sunday, Nov. 11, get a free Entrée. Free tall brewed coffee for all Veterans & Active Military this #VeteransDay, Nov. 11. (Participating locations only). To thank service members past and present, on Veteran’s Day on Nov. 11, get a free personal 1-topping pizza for active duty, national guard, retired and veterans with valid Military ID or proof of military service. 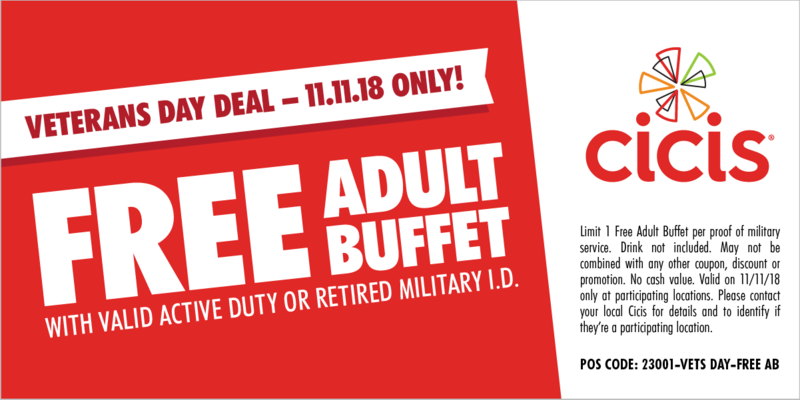 Free pizza buffet if you show a valid Military ID on 11/11/18. November 11, 2018, participating Circle K convenience stores will offer a free Polar Pop to military Veterans. Sunday, November 11th and choose a free meal from their Veterans Menu! Available all day, dine in only. This Veterans Day all Veterans receive a free sundae at all scoop shops. #VeteransDay. Veterans and active military can stop in for a complimentary brunch on Veterans Day. Free single cone for veterans and military personnel on Veterans Day. Free Tavern Burger with the purchase of a beverage for Veterans and Active Duty Military on Veterans day 11/11/18. 50% off the entire bill for all military veterans on 11/11/18. All day Sunday 11/11, Veterans and Active Duty Military can enjoy a free 16 oz drink of their choice with uniform or Military ID. On Veterans Day, a free doughnut and small coffee will be on the house. On Veterans Day active and retired military (with ID) & up to 2 family members get 25% off their bill at participating locations. Free Mom’s Ricotta Meatballs & Spaghetti entrée this Veteran’s Day, Sunday, November 11th to all veterans and active military. Veterans receive 25% off their entire check on Veterans Day, at participating locations. Veterans and active duty will receive a free sandwich and slice of cake (while supplies lasts) on Veterans Day, 11/11/18. Show your military I.D. on #VeteransDay (11/11) at any MOD location, and they’ll proudly serve you a free MOD-size pizza or salad. All shops are offering veterans a free bagel and cup of coffee on Veterans Day from 6 a.m. to 4 p.m.
On November 11, Orange Leaf Frozen Yogurt will be offering free frozen yogurt for all active and retired military at participating locations. Veterans get a free Bloomin’ Onion® and a beverage on Veterans Day. Must have valid identification. Free self-serve fountain or hot drink to Veterans & active Military members. Valid only 11-11-18. Show Military ID at checkout. Veterans and active duty military get a free single topping 9″ or 11″ pizza on Veterans Day this Sunday, November 11th. Free breakfast for all current and former military on Veterans Day, November 11th. See Shari’s Pies comments for promotion. Sizzler is proud to honor and celebrate United States veterans and active-duty military personnel with a free lunch and beverage before 4 p.m. on Veterans Day, Sunday, November 11, 2018. On Sunday, November 11, enjoy a free meal, past and present military. Veterans and Active Military get one free entree and drink on 11/11/18. All who have served get a free breakfast on Veterans Day. Free coffee for veterans, active duty and family members on Sunday, 11/11. Visit any of location on November 11th for a free 16 oz drink of choice on them. See additional Veterans Day offers. You should tip your server. They’re working hard to serve you and depend on the income. We recommend tipping on the actual cost of the meal.